While visiting a friend's place last week, I picked up a copy of New Yorker Magazine that was lying on the end table in his living room. I flipped to an article about Jeremy Corbyn, Britain's new Labour Party leader, and read this: "It is easier for people to imagine the end of the earth [Earth?] 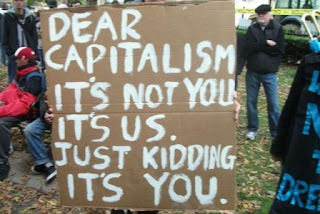 than it is to imagine the end of capitalism." I nearly gasped out loud. I'd heard before that Canadians "would rather die comfortable than live uncomfortable" (see this post), but this was the first time it had been pointed out to me so starkly that those made comfortable by capitalism are NOT going to bite the hand that feeds them, even if that hand is killing off their children's future. "Think about the strangeness of today's situation. Thirty, forty years ago, we were still debating about what the future will be: communist, fascist, capitalist, whatever. Today, nobody even debates these issues. We all silently accept global capitalism is here to stay. On the other hand, we are obsessed with cosmic catastrophes: the whole life on earth [Earth?] disintegrating, because of some virus, because of an asteroid hitting the earth, and so on [um, climate chaos?]. So the paradox is, that it's much easier to imagine the end of all life on earth than a much more modest radical change in capitalism." It's true, isn't it? Capitalism (of the globalized sort) has become the metaphorical water we swim in -- so we can't see it for what it is ... unkind, unfair, exploitive, lying, inequitable, dangerous, dirty, carbon intensive and greenhouse-gas-spewing. We've created quite the mess, haven't we? 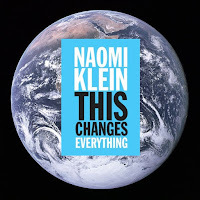 It's led to what my hubby calls a "widespread de facto conspiracy to keep supporting the fossil fuel industry and its tacit support by the majority of governments, scientists and and NGOs." 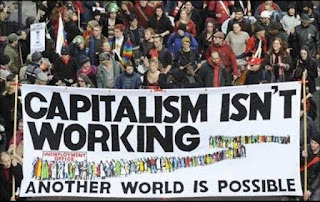 According to Žižek, it's possible that all we need is a "modest radical change in capitalism." I like that: "a modest radical change" ... but a radical change nonetheless. "We have been told it's impossible to get off fossil fuels when in fact we know exactly how to do it -- it just requires breaking every rule in the 'free market' playbook: reining in corporate power, rebuilding local economies and reclaiming our democracies." "Free market" in quotation marks? Yes, that's because it's not a free market. We're actually subsidizing fossil fuel corporations with direct and indirect subsidies in the trillions of dollars per year. With our tax dollars. Which also pay for all the externalized costs of fossil fuel burning. So it sure ain't a free market for us! Reining in corporate power? Yes, how about a change to the corporate charter? Making it law that corporations must internalize all their health and environmental costs before counting their profits and paying dividends to their shareholders? How about if we start clearly picturing how capitalism is ending life on Earth -- and then start imagining how we're going to stand up for the children and end the destruction? it was fine until you got greedy!